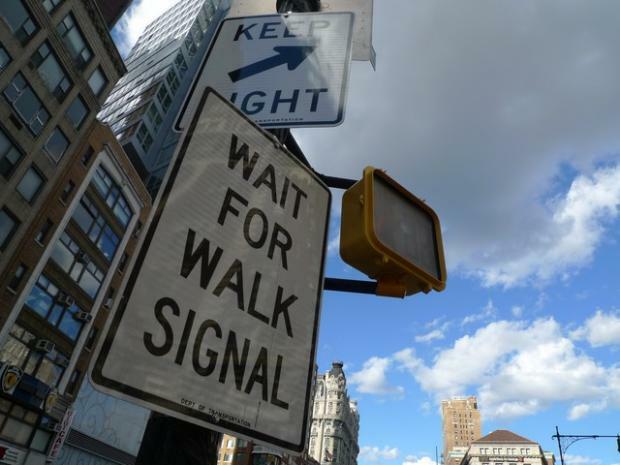 UPPER WEST SIDE — An intersection long decried as among the most dangerous in Manhattan got a "safety makeover" Thursday, with the city unveiling pedestrian countdown clocks in the first in a series of safety improvements slated for the busy crossing. Broadway and Amsterdam criss cross at West 71st Street and commuters rush to and from the 72nd Street subway stop at the bustling crossroads, known as a "bow tie" intersection. The intersection has seen 69 accidents in the last two years, including one fatality, city officials said. DOT's proposed safety improvements, unveiled Thursday, would shrink crossing distances for pedestrians by extending sidewalks, curbs and medians further into the street. "It gives them a little bit more of a comfort area, a shorter crossing distance," said DOT spokesman Monty Dean. Borough President Scott Stringer and Assembly Member Linda Rosenthal lauded the DOT's plan to improve safety at what they called "the bow tie of death," saying in a joint statement that "the west side community nightmare is finally over." Stringer and Rosenthal had criticized the DOT in August for not moving fast enough to improve safety at the intersection. The intersection saw 25 accidents in 2009, and eight accidents in 2010 to date, according to Stringer's office. "In August 2009, a taxi cab careened into the southern West 72nd Street headhouse on Amsterdam Avenue, and only weeks ago, another cab crashed into the south island of the 71st Street intersection, sending a woman to the emergency room in critical condition," Stringer's statement said.